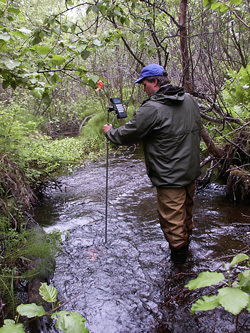 FishXing consists of software and learning systems to analyze fish migration through several types of culverts. FishXing gives detailed profiles of hydraulic conditions and fish performance inside a variety of culvert types. This program does Manning equation calculations as well as backwater water surface profile calculations. It also incorporates fish performance data into the program to make fish passage determinations. FishXing is free and available for download at the Aquatic Organism Passage website. 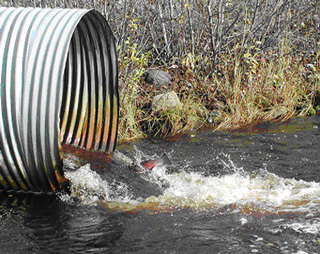 FISHPASS provides the analytical capabilities to assess whether a culvert or a battery of culverts will pass weak swimming fish efficiently and safely. The application uses hydraulic formulas describing profile drag (velocity), non-Archimedean buoyant (gradient) forces, and virtual mass forces to quantify the hydraulic conditions within a culvert that weak swimming fish can sustain without exhaustion. This design is not based on acceptable cross-section culvert velocities. Rather, the design method evaluates the component hydraulic forces within a culvert against a fish's available power and energy capabilities. The application can further differentiate between the red muscle (aerobic) propulsive mode typically used by fish within the culvert and the white muscle (anaerobic) propulsive mode used under most flow regimes at the culvert inlet and outlet. Power and energy evaluations are particularly useful in steep culverts, perched culverts and culverts with significant inlet contraction where virtual mass and gradient forces become significant relative to profile drag (velocity). The FISHPASS computer modeling program and background documentation are published in: Behlke C., Kane D., McLean R., and Travis M. 1991. Fundamentals of culvert design for passage of weak-swimming fish. Alaska Department of Transportation and Public Facilities Report No. FHWA-AK-RD-90-10. Fairbanks, AK. Before using FISHPASS, we recommend that users read and become thoroughly familiar with the Behlke et al. publication. The required data inputs and design results will be more meaningful if the underlying theoretical concepts and assumptions are fully explained and understood. Minimum: DOS 3.31 or higher with an 80286, 8088 or 8086 processor with 640 KB of RAM and a monochrome monitor is required. A math co-processor will speed the computations up, but be aware that the program will run very slowly on an 80286, 8088, or 8086 processor. Preferred: An 80386 processor, with a math co-processor, or an 80486-DX2 processor with a color monitor is recommended. The program is mouse-supported but can be run directly from the keyboard. Disk Space: The FISHPASS.EXE file occupies 181,728 KB of disk space. FISHPASS.ZIP - This is a "Zip" file that contains both the executable program (FISHPASS.exe, 177 KB) and the documentation for the program (FISHPASS.doc, 734 KB) in Word format.